11 LISTS Unreal Fails You Won't BelieveOof. There are few things more entertaining than the heart-wrenching misery of other people. Some of the greatest moments in cringeworthy Internet videos can be found within the hundreds of videos of people being denied a fair maiden's hand in marriage in some brutal, embarrassing, and public way. So, here are the best (worst?) videos of guys making terrible decisions with what's supposed to be one of the greatest moments of their life (leading to what is probably the worst moment of their life). Romantic gestures are no match for open bodies of water. 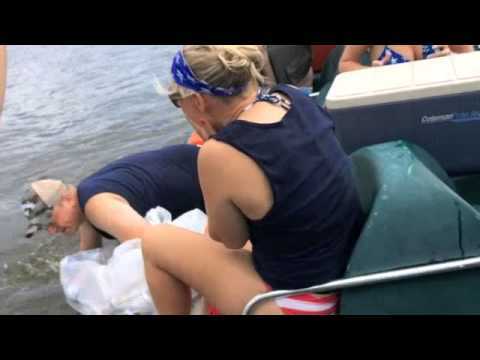 It's a lesson Wisconsinite Shane learned after trying to propose to his girlfriend on a paddle boat in the Wisconsin River. Shane prepped for the big event by inviting his girlfriend, Cheri, and a few friends onto the water. Once out there, he told Cheri to look over at the shore, where more friends stood with signs that said "Will you marry me?" Unfortunately, Cheri's excited answer caught Shane a little off-guard. During the proposal, she inadvertently knocked the ring out of Shane's shaking hands and into the water. The couple searched for two days, but couldn't find it. Lucky for Shane, Cheri agreed to get engaged anyway. Unluckily for Shane, he's got to shell out for another ring. Nothing quite like turning your engagement into a giant half-time show. This game, apparently, is called "find the mascot while blindfolded." 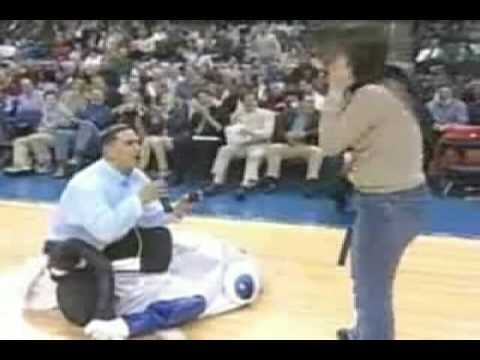 Having successfully found the mascot the young girl gets her prize, the Mascot deflates and out of its leathery skin walks her boyfriend, ready to propose. This winner, who looks like the kind of guy who actually uses a belt attachment for his cell phone, takes a knee and in an extremely insecure sounding voice says 'baby, baby, baby' while his now ex-girlfriend runs away. His biggest mistake? Nobody wants to marry a mascot. Special thanks to 2009's Keyboard Cat for providing us with musical stylings and playing the girl out of the stadium. The craziest part about some of these is that the girls don't just say no, they RUN out of wherever they are, like they're in danger. Judging by a lot of the guys on this list, though, maybe they are. Tip #1 for getting engaged: If you're an athlete (even if it's college level) don't let the news announcers know that you plan to propose to your girlfriend, especially if they work for Fox. 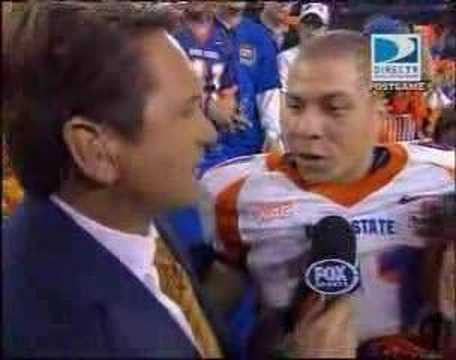 After a victory for Boise University, Fox sent a reporter to talk to star player Ian Johnson. While Ian stands there with his girlfriend by his side, about to pop the question, the reporter says, as a transition, "... Now, I know you're going to propose to your girlfriend! Congratulations!". Luckily, everything worked out fine when Ian dropped to his knee as his girlfriend excitedly yelled "Yes!" Star Football Player marries the Head Cheerleader? That's the type of Ultra-American happy ending that Fox lives for. This idea seemed sweet. After two years of being together our proposer decided to pop the question at the very park they went to on their first date. Furthermore, to recreate that first date, he got a heart-shaped balloon. He claims he got her the same balloon on that first date. Up until this point it's a pretty adorable engagement idea.... Until he begins to tie the ring to the balloon (I think you can see where this is going). His friend is filming from a distance and catches the entire scene. He walks up to her and hands her the balloon. They walk for a bit and then he takes a knee. In excitement she lets go of the balloon which promptly flies away and our suitor immediately starts yelling and chasing down the balloon. Why? Because it has the ring on it. How has this guy managed to live this long? Did she say yes? That's up for debate. Perhaps she realized how poorly thought out his proposal idea was and decided against sharing an income, home and family with him. Anyone would, really. This video seems almost too good to be true. Almost.